For hassle-free and economical colour printing choose official HP toner. This cyan cartridge features HP's proprietary Smart Printing technology and delivers professional results for all types of documents. Brochures, marketing materials, and client reports look stunning. 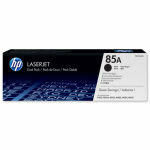 Achieve print shop quality when using this toner with your Colour LaserJet printer. When you use genuine toner from HP you are assured, not only of achieving outstanding results, but also clockwork reliability and value for money. All things every user requires; whether they be business, academic, or home users. Specially formulated for LaserJet printers, and manufactured with HP's proprietary Smart Printing technology, the Cyan CE311A delivers high-quality images and text with brilliant colour. Ideal for all publications including reports, coursework, or promotional materials the controlled flow of toner ensures no misprints and consistent results throughout a print run. 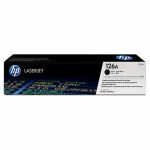 Colour printing can be expensive but costs can be minimised with this official HP cartridge. The excellent quality of print ensures no wasted pages and, as the toner is specifically formulated for your printer, there will be no spillages or hardware problems ensuring production remains at a maximum level keeping the cost per printed page at a minimum.